Spray painting can be a messy job, whether you’re using an airless sprayer or an aerosol spray can of paint. Even when you’re being careful, over-spray drifts through the air and settles on everything in the vicinity. When your eyeglasses get sprinkled with paint, you have several options for removing the paint. What you use will depend on the type of spray paint, but you should be able to get your eyeglasses clean with supplies you already have around the house. Use rubbing alcohol if you don’t have water handy. Rubbing alcohol also removes dried water-based paint. Soften old paint with ammonia or window-cleaning products containing ammonia. Consumer Reports states that ammonia will soften water-based paint. Warm some vinegar and use it to rub the paint specks away. In addition to being an effective glass-cleaner, vinegar will help remove paint over-spray. Wet a rag with mineral spirits and rub away oil-based paint over-spray. This will only work if the paint is still wet. Rinse the mineral spirits away with warm, soapy water because it can irritate your skin. Rub dried oil-based paint (or any type of solvent-based paint) off with acetone. Use nail polish remover if you don’t have acetone--acetone is the active ingredient in most nail polish removers. Clean the paint off as soon as possible. Spray paint is much easier to remove before it’s had a chance to completely dry. 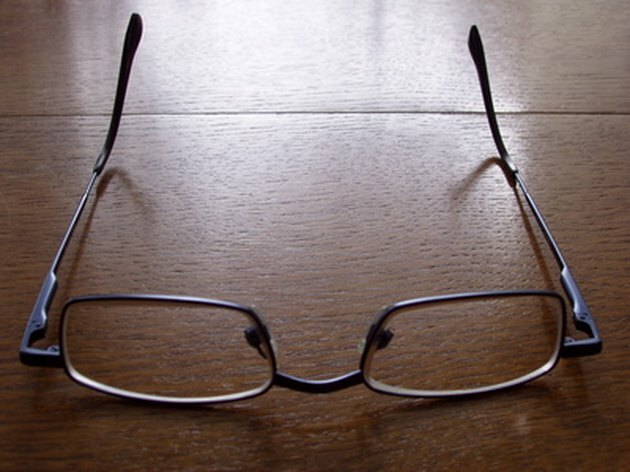 Avoid using abrasive cleaners or sponges on the lenses, because you might scratch the glass or plastic.